ANSWER: Tinnitus — the sensation of hearing a sound when no external sound is present — often is described as a ringing, buzzing, roaring, clicking, humming, pulsing, or hissing sound, or any combination of these sounds. You may hear it in one or both ears. The sound may be present all the time or off and on. 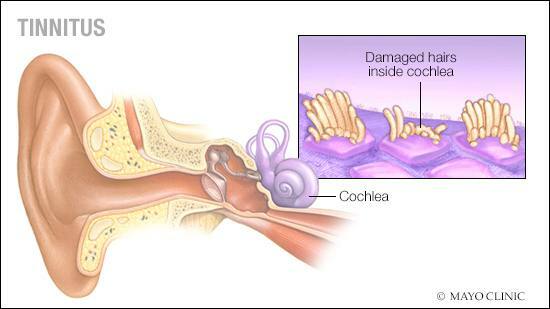 If you have tinnitus that doesn’t go away, a hearing evaluation is recommended. In most cases, tinnitus can be managed fully. But, for some, it’s a chronic condition that can affect sleep and everyday function. Fortunately, there are options to reduce its effects. In many people, tinnitus has been linked to hearing loss — both age- and noise-related. It can occur from earwax blockage, from bone changes in the middle ear (otosclerosis) and as a side effect of a number of medications. Other conditions associated with tinnitus include head trauma or a concussion; inner ear conditions, such as Ménière’s disease or an acoustic neuroma; head or neck injuries; or problems with the joint where your lower jawbone meets your skull (temporomandibular joint). High blood pressure and factors that increase blood pressure, such as stress, alcohol use and caffeine consumption, can make tinnitus more noticeable. Although there’s no known cure for most cases of tinnitus, many people can manage it. For most, the goal is to lessen their awareness of tinnitus. If tinnitus is due to a health condition, your health care provider may be able to recommend steps that could reduce the noise. This may involve removing excess earwax, treating an underlying vascular condition or changing medications if one is contributing to the problem. Hearing aids also can help. Properly fitting hearing aids can address hearing loss. And tinnitus sometimes can be reduced if you can better hear sounds around you. In some cases, white noise (masking) may help suppress tinnitus so that it’s less bothersome. In addition, there are several promising therapy options for management of tinnitus. These include music therapy devices and methods for managing tinnitus; tinnitus retraining therapy, which involves using devices to “train the brain” to ignore tinnitus; and cognitive behavioral therapy, which focuses on replacing negative thoughts with positive ones to change your reaction to tinnitus.